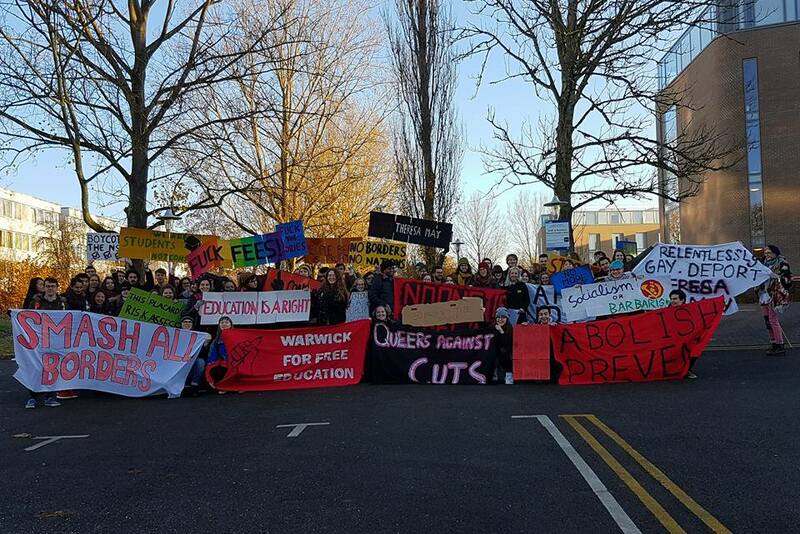 Today, a group of student activists have occupied ‘The Slate’ – Warwick’s brand new £5.3 million conference facility – in protest against the disastrous direction in which higher education is being pushed, and our own institution’s complicity in that agenda. We are at a truly pivotal moment for higher education. This government is set to usher in the full marketisation of the sector, with devastating consequences for both students and staff. Student debt is set to rise, academics will be pushed to breaking point, and private companies will be given a free pass to take over and profit from public universities driven to collapse. This is the product of years of students being treated as consumers and universities being run as businesses, the impact of which is felt very strongly here at Warwick. As we sit in this cutting edge facility purpose-built for external companies and businesses, students and staff are experiencing a drastic deterioration of learning, working and living conditions. As tuition fees go up, students don’t even have enough space to study or to sit in lectures. As management salaries continue to surge, hourly-paid teachers are struggling to survive. As international students face ever-increasing financial exploitation, they are subject to tighter monitoring and further marginalisation. As Warwick prioritises corporate conference space, they fail to provide enough housing for students year upon year. In addition to this, the University actively represses protest and activism which seeks to challenge these issues. The University of Warwick is knowingly making unnecessary and harmful choices. By occupying this space we are taking direct action to hold the University to account for these decisions, and to force them to instead make ones which are in the genuine collective interest of students, staff and the future of public higher education. The Teaching Excellence Framework (TEF) is a core aspect of the government’s disastrous higher education reforms. This is a system which will rate universities based on meaningless metrics and use that information to allow certain institutions to raise tuition fees even further, thus establishing a marketplace in the higher education sector. However, the TEF is an entirely voluntary programme which universities must actively choose to take part in. Both students and staff at Warwick have made their opposition to the TEF very clear. The student body has passed democratic policy to campaign against the TEF, and staff voted overwhelmingly to oppose the reforms at the historic meeting of the Assembly. Further to this, the Students’ Union called an extraordinary meeting of the Senate to urge members to take a stand against the TEF, at which many members simply stayed silent and a formal vote was denied. The official “democratic channels” of the University have failed, and those with the power to make decisions are still not listening to the voices of students and staff. We are left with no other option but to pursue direct economic disruption to force the University to opt out of TEF. Over the past few years, Warwick University has become notorious for poor treatment of academic staff. Hourly paid teachers at the University of Warwick are underpaid, undervalued and work in unacceptable insecure conditions. We fully support the demands of Warwick Anti-Casualisation for stable contracts, equal employment rights and fair remuneration for all the work staff do. We recognise that fair teaching conditions are essential not only for the rights and wellbeing of workers, but also for the quality of education they are able to provide to students. These demands are crucial for the whole community, and we stand in solidarity with Warwick Anti-Casualisation in pushing for the University to engage with them. Tomorrow marks exactly two years since police were called to a sit-in for free education at Warwick, which resulted in the mass assault of student protesters at the hands of West Midlands Police and private security guards. We have not forgotten the violence, the CS gas, the threat of tasers. We have not and will not forget the disgraceful way in which the Vice-Chancellor responded to this attack, as condemnation and outrage poured in from across the country. We demand that the University apologises for this enormous failing of students and properly recognises the damage that has been caused. The day after these events, Warwick saw a thousand-strong #CopsOffCampus demo which ended with hundreds of students initiating an occupation of the Rootes building. This occupation was brought to an end when, after refusing to even engage with the occupiers’ demands, the University chose to take students to court and spend thousands of pounds on a draconian injunction which bans all “occupational-style” protest across the whole of campus. These injunctions have been condemned by various human rights and legal organisations as a clear violation of the right to protest, rendering this a glaring tarnish on Warwick’s reputation. Today, not only do we directly challenge this injunction with our actions, but we demand that the University commits to scrapping the injunction altogether. We cannot overstate the urgency of the political moment we find ourselves in. When so much is at stake, and when institutions fail to take necessary meaningful action, we are left with no choice but to deploy methods of direct action which have historically been so crucial in forcing progressive political change. No to casualisation of staff! No to repression of protest! [At the time of writing there are still two workers in the space with the occupiers. We have agreed with them that they will finish the rest of their shift before they leave the space to minimise the inconvenience to them. There has been a constant and amicable dialogue and they have assured us that they feel completely safe, happy and free to leave at any time. It’s a shame that the reactionary above shares my name. I can assure you that Christian Smith, ex-teaching fellow at Warwick English, is fully in support of this occupation. Warwick University Limited needs to be confronted continuously for its anti-scholarship, anti-student, and anti-worker policies. They are trying to out-source seminar tuition. They made me redundant and replaced me by an hourly paid worker, and then stripped me of my library research access because I wouldn’t agree to never critique the university on social media. This is happening all over the university, and it will greatly lessen the quality of teaching in the depts. They would like to have us all become snitches through the Prevent program. The campus is awash with constant capital from corporations. I salute you all from the streets of Berlin! All power to the students and workers! Well done! Keep up the good work. Let’s spread the word and encourage students and staff across the sector to support this brave action and initiate their own actions to force change on these critical issues. University students and university staff are being squeezed and effectively cheated by the current trend of HE institution management toward demanding more from staff and students while removing the support required. Return the running of HE institutions to academic staff and students; the problems arise when institutions are run by administrative staff who have little interest and less knowledge with regard to the purpose of universities.